Happy for me…as I get another day off and a Mamogram and an Ultrasound…Yeah!!! Anyhoo, at least I have the day off! to use Red and Brown on our project! text stamp is from Stampabilities/ Michaels. 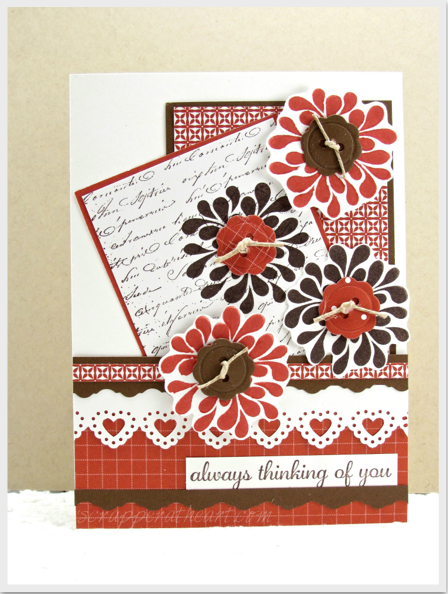 The button centers on the flowers is a die cut from MFT. Paper is from Stampin Up and the Cardstock is Gina K Designs. This card is going to be in the mail very soon and on it’s way to a dear friend! I plan on showering her with as many cards as possible! She needs it and is in my heart continuously! Categories: Cards | Tags: Card making, Cards, color challenge, encouragement, Flowers, rubber stamps, stamping, Stamping Up, Thinking of you | Permalink. She will LOVE this Pretty card, Nancy! LOVE the flowers and the heard trim! You are a Great Friend! I love this and all of the wonderful layers! Great job, girlfriend! Love your design for tghe challenge. AWEsome!! Love your flowers over the sheet music like thsi! Thanks for playing along in our Mod Squad challenge this week! Beautiful card, Nancy! Love the flowers and rich color combo! This card is awesome Nancy. And you’re right, you may not know where you got that stamp, but it’s a keeper. I love the way it kinda moves. Great color choices and embellies too.